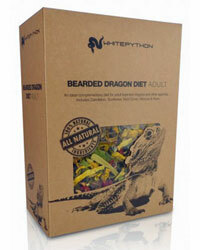 The WhitePython Bearded Dragon diet is an ideal complementary food source to enhance the nutritional intake of your Bearded Dragon. The Adult Bearded Dragon diet consists of an all natural mixture of dried flowers and plants that can be very difficult or costly to come across fresh. This mixture is recommended as a complementary diet only and should be fed in conjunction with live insects and other fresh fruit and vegetables.